Introducing the new Aveeno Skin Relief Gentle Scent Collection - infused with the moisturizing properties of coconut and the calming and soothing properties of chamomile, proven to help soothe itchy, dry, sensitive skin. 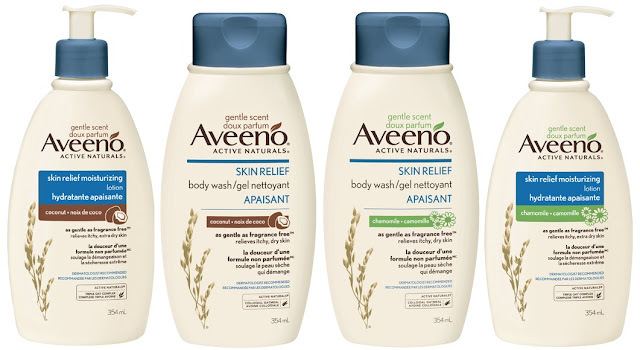 Aveeno Skin Relief Gentle Scent Body Wash - 354ml - $9.99 - in Oat & Coconut and Oat & Chamomile - with a mild and gentle soap-free formula containing Active Naturals colloidal oatmeal to gently cleanse without leaving skin feeling tight, to leave itchy, dry skin feeling soothed and moisturized. Aveeno Skin Relief Gentle Scent Lotion - 354ml - $13.99 - in Oat & Coconut and Oat & Chamomile - with a mild and gentle formula infused with Active Naturals triple oat complex and dimethicone to start working to soothe itchy, dry skin in just one day and moisturize for a full 24 hours. Sensitive skin sufferers who have had to forgo scent in their bath and body products up to now will be thrilled with Aveeno's very first scented collection - which still contains all the dermatologist and allergy-tested goodness that we are used to and is clinically shown to be as gentle on sensitive skin as the fragrance-free products. Available now at drug, food and mass retailers across Canada. I am pretty sensitive to scent, but I would be willing to give this a try. I love the scent of coconut.